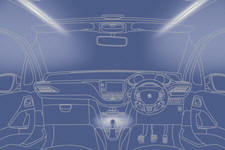 The dimmed passenger compartment lighting improves visibility in the vehicle when the light is poor. At night, interior mood light emitting diodes - LEDs (courtesy lamp, instrument panel, footwells, panoramic sunroof...) come on automatically when the sidelamps are switched on. The interior mood lighting switches off automatically when the sidelamps are switched off. 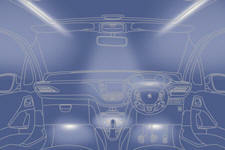 Illumination of the centre console and panoramic sunroof can be set from the audio system.